Today is the last day of June, and we are theoretically just right in the middle of the year, with the other half of 2018 starting from tomorrow. The warm summer is already in full swing in the northern hemisphere, with several countries reporting temperatures in the high 30's. I was in Beijing in third week of the month, and the temperature was unbearably hot, hitting 35degC to 38degC. Coupled with a Relative Humidity of 17%, it felt a lot hotter and drier when outdoors. The temperature range this far north in China is quite amazing, when one considers that just six months ago, in December when I was there, it was a bone-chilling -4degC! What was interesting in Beijing, was that in the three days that I spent there, the air quality was surprisingly good. Perhaps government intervention has finally reaped some positive results in terms of reducing the pollution in this capital city of China? Any commentary on world news in the month of June surely cannot omit the historic summit between US President Donald Trump, and North Korean leader Kim Jong Un. For the first time, a sitting US President and a North Korean leader, representing two countries which have never seen eye to eye nor whose leaders ever met before, will meet face to face, and our little red dot island nation host this unprecedented meeting. With North Korea's denuclearisation on the cards, and primarily to avert a nuclear war in Asia, the stakes are high, as all eyes watched closely the meeting between two highly volatile and eccentric leaders. That the island nation of Singapore was chosen is testament to its efficiency, infrastructure and organisational competency. Nevertheless, the government of Singapore and its agencies rose to the occasion and the summit went without a hitch - albeit with a negligible inconvenience to the routine lives of locals who went about their daily business. But the usual complaints and grouses were almost silenced, as most would understand the serious consequences should anything untoward happen to the summit as a result of organisational or logistical oversights! What was amusing were the handful of 'wefies', courtesy of our own politicians - probably the first ever taken of Kim Jong Un, and then posted on social media. The North Korean security personnel stopped anyone close enough during Kim's evening walkabout in Singapore from taking photos of him, but were most likely caught unawares that Singapore's Ministers would be brazen enough to take wefies of their beloved President. No harm done, but another 'first' amongst firsts during this historical summit. Closer to home, the new Malaysian government created certain surprises, one of which was the cancellation/deferment of the High Speed Rail system linking Kuala Lumpur and Singapore. Citing reasons of high costs and rising debt, Prime Minister Dr Mahathir's government reviewed several high-budget projects in Malaysia. He also raised 'long-buried' bilateral issues like the Pedra Branca islands and the supply of water to Singapore. Interesting times ahead for Singapore and our physically closest neighbour. 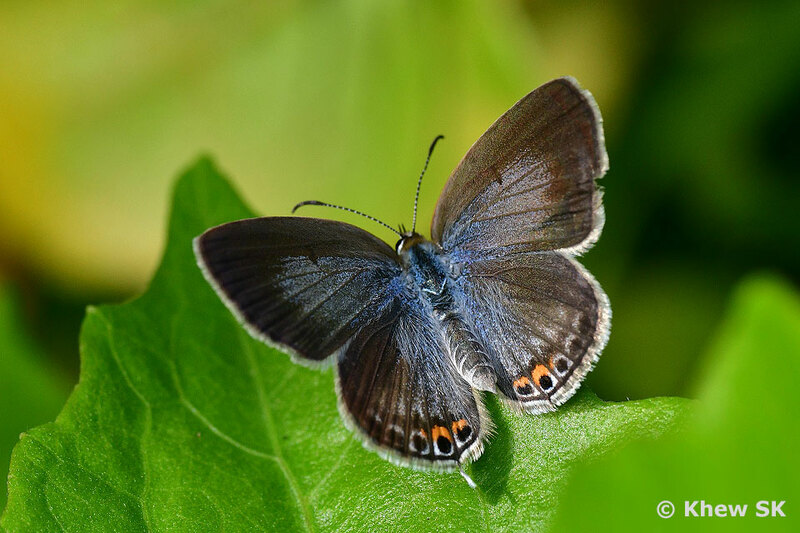 Back to our Butterfly of the Month for June 2018, we feature a relatively small and common species, the Gram Blue (Euchrysops cnejus cnejus). The Gram Blue is a widely distributed species, and is sometimes common in urban areas where its caterpillar host plants, Tropical Kudzu (Pueraria phaseoloides) and Creole Bean (Vigna reflexopilosa) can be found. These common creepers usually appear in recently cleared road verges and newly planted areas. The Gram Blue is usually found fluttering restlessly amongst low shrubbery along roadside greenery on hot sunny days. 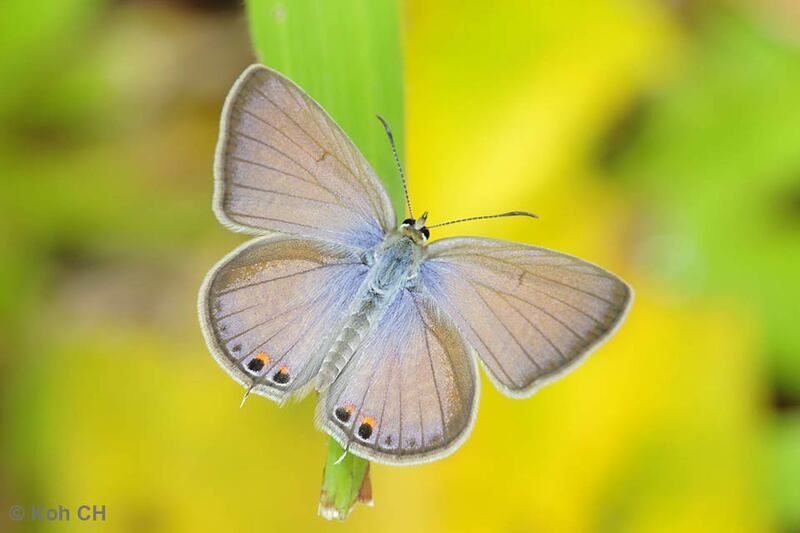 Where it occurs, it can sometimes be even abundant, with up to a dozen individuals - both males and females, fluttering around and frolicking in the sun. 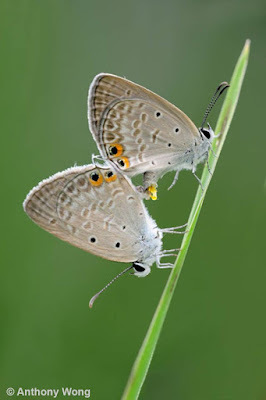 The male of the Gram Blue is light purple blue above, whilst the female is heavily black-dusted, with the wing bases a pale shining blue. 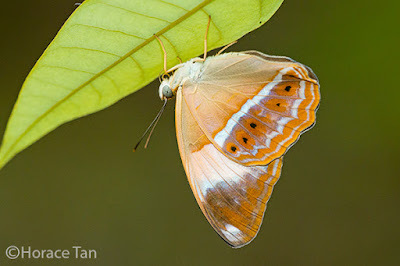 The underside is pale buff, with the usual dark grey striations and spots. 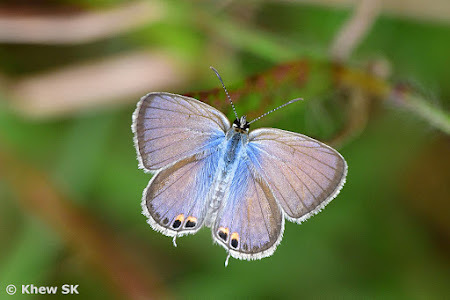 The two prominent black spots on the costal area on the underside of the hindwing is quite consistent in many lookalike species like the Cycad Blue, Forget-Me-Not and Silver Forget-Me-Not, creating a bit of confusion when these species are observed in the field. 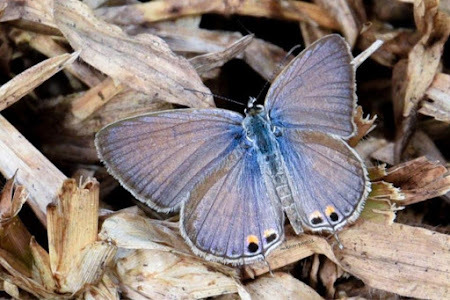 However, to distinguish the Gram Blue, look for the two orange-crowned black tornal spots on the underside of the hindwing. These spots are also edged with metallic green scaling. 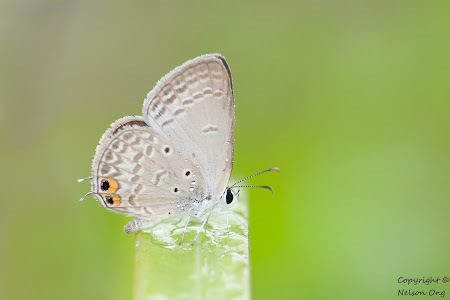 The tails of the Gram Blue are also shorter than its lookalike cousins and with these few diagnostic features, identifying the Gram Blue should be less of a challenge. 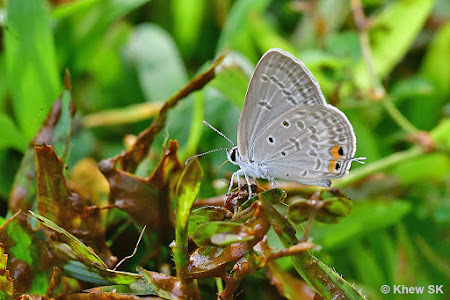 At certain hours of the day, both the males and females of the Gram Blue may be seen opening their wings to sunbathe on leaves and blades of grasses in their usual habitats. 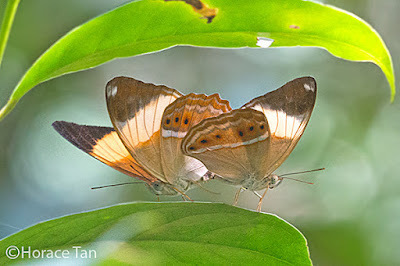 Males also chase each other and when one is perched to rest, another individual may "attack" it and get it to fly off in an endless chase. Males of the Gram Blue may also be observed to puddle at damp sandy footpaths and also decomposing organic matter. 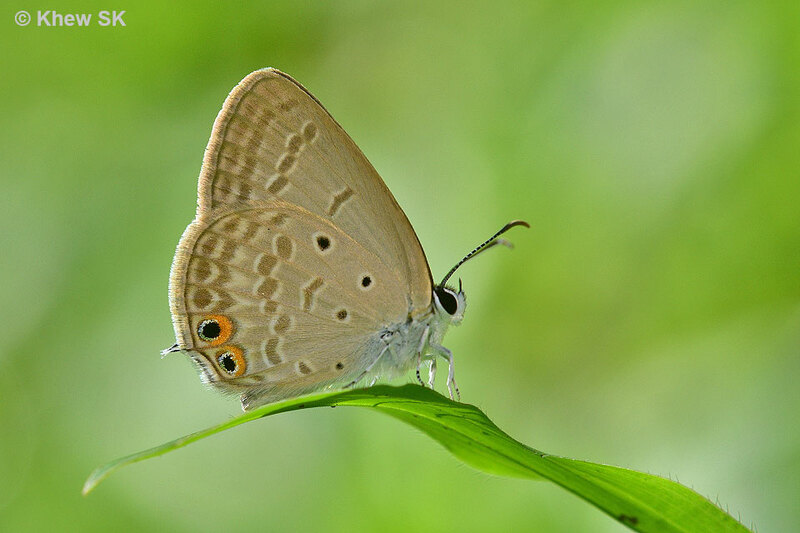 The caterpillars of the species are attended by ants, and the pupa attaches itself to the underside of leaves with a very thin silken girdle. Caterpillar Local Host Plant: Ryparosa scortechinii (Achariaceae). On the upperside, the wings are orchreous brown with a broad yellow post-discal band on the forewing. The apical area beyond the yellow band is dark brown to black. 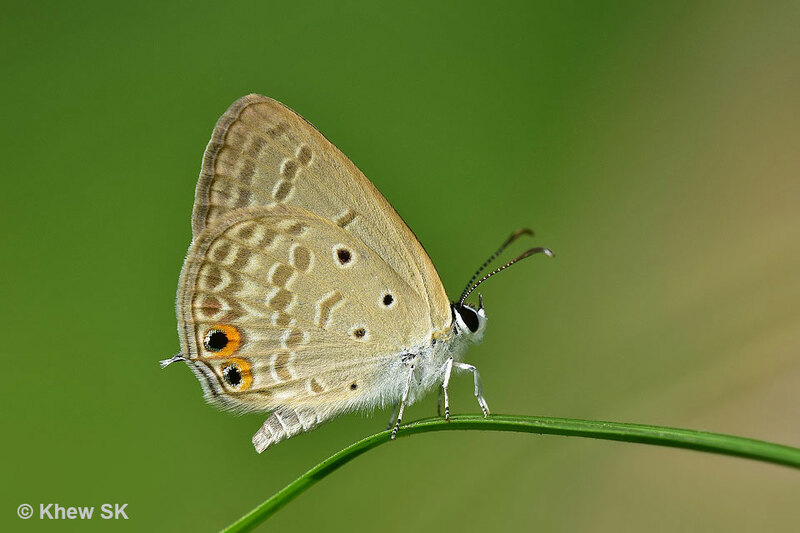 The hindwing has black marginal, submarginal and distal lines, and a series of black post-discal spots. 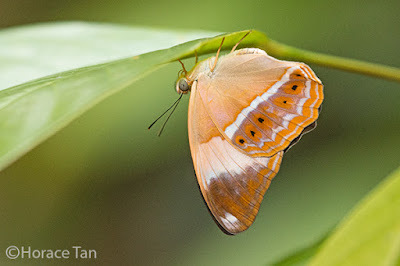 On the underside, the wings are paler orcheous brown than the upperside and the broad discal band in the forewing is whitish. 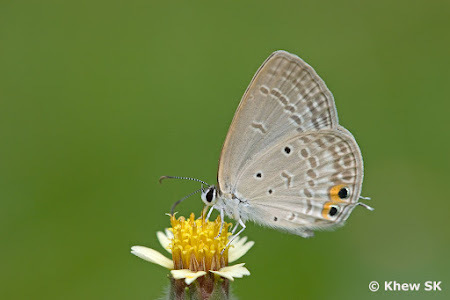 The broad apical area on the forewing has two white apical spots. The hindwing has white marginal, submarginal and distal bands, and the series of small black post-discal spots are embedded in larger orange spots. The female is paler than the male. The Banded Yeoman is moderately rare in Singapore, and has only been encountered at a few sites in the nature reserves. The adults are rapid in flight and not easy to photograph. Typically, photography opportunities arise when the males are puddling on wet ground, or when the females are taking breaks between oviposition runs. 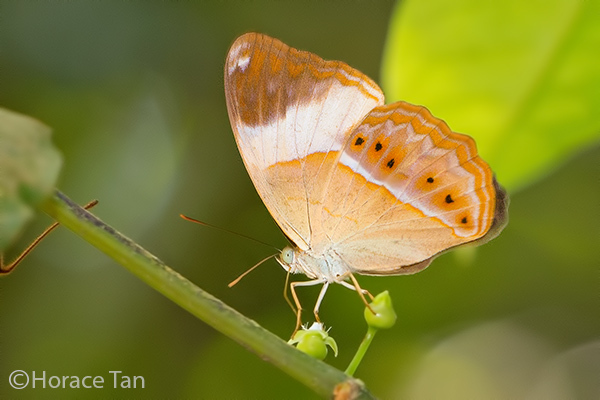 In flight, the Banded Yeoman can be mistaken for the Rustic (Cupha erymanthis lotis), which is the commoner of the two species in Singapore. Caterpillars of the Banded Yeoman have been observed to feed mainly on young to middle-aged leaves of the local host plant, Ryparosa scortechinii. 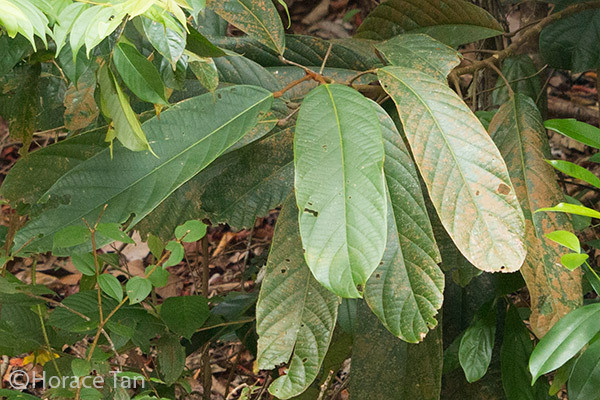 This plant is found only at a few sites in the central catchment reserve. 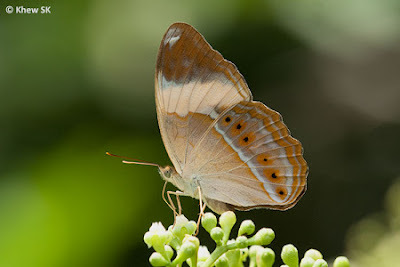 The scarcity of this plant confines the occurrence of the Banded Yeoman to the surrounding forested areas. Local host plant: Ryparosa scortechinii. A mating pair of the Banded Yeoman. 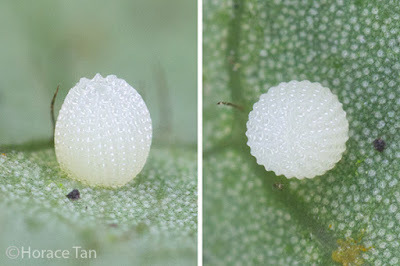 Eggs of the Banded Yeoman are laid singly or in small groups of 2 to 3 on the leaf underside or young shoots of the host plant. 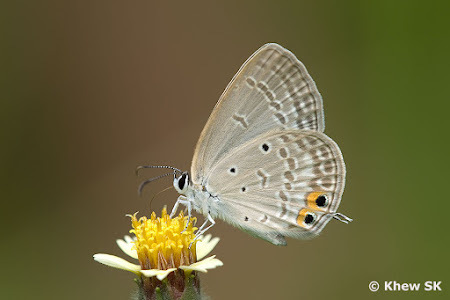 Sometimes eggs can be found laid on the cobweb or other plants in the vicinity. 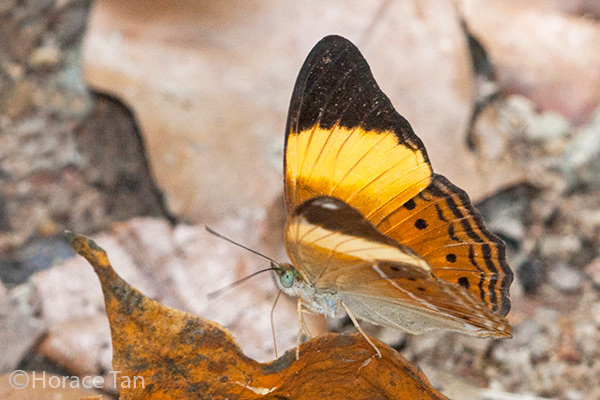 A female Banded Yeoman laying an egg on the leaf underside of the host plant. A female Banded Yeoman laying an egg on the stem of a vine in the vicinity of the host plant. 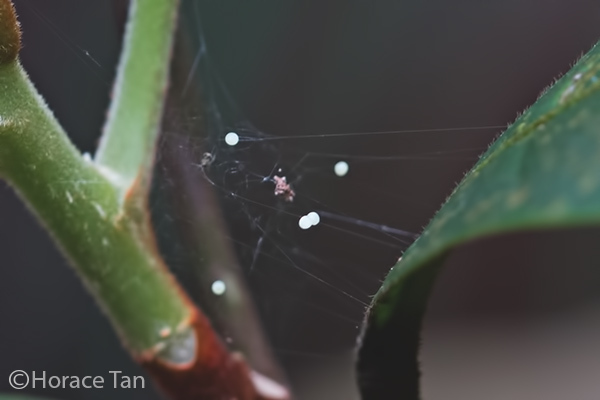 A number of eggs laid on a cobweb spun between stem, petiole and leaf of the host plant. The whitish egg is somewhat globular in shape and its surface is marked with small rectangular to hexagonal pits. The micropylar sits atop the egg. Each tiny egg has a diameter of about 0.75-0.8mm, and a height of about 0.8-0.85mm. 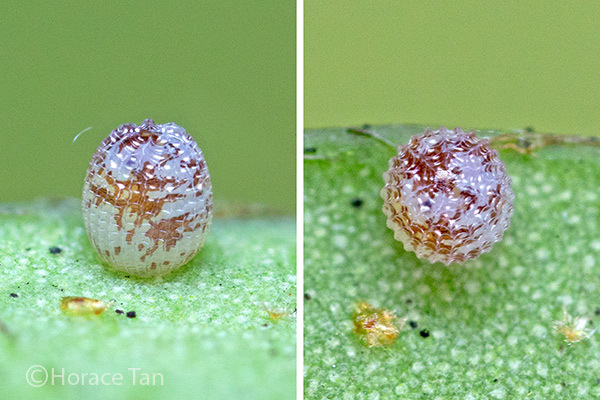 Two views of an egg of the Banded Yeoman. Two views of a maturing egg of the Banded Yeoman. 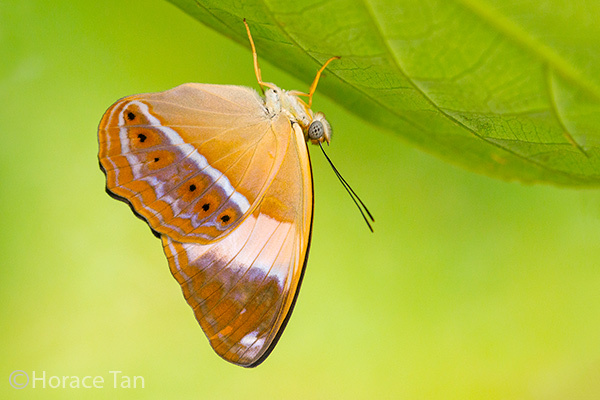 The egg takes about 2.5 to 3 days to hatch. The young caterpillar emerges by eating away part of the egg shell. The rest or part of the remaining egg shell becomes the first meal for the newly hatched which is about 2mm in length. 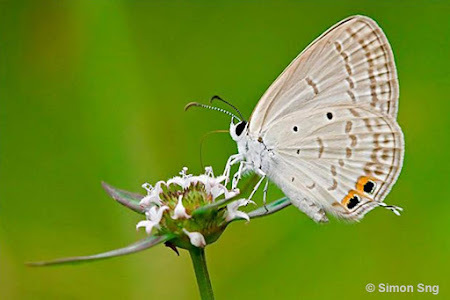 It has a cylindrical and pale pinkish body covered with many small tubercles and long setae. The head capsule is coloured as per the body and has two large black lateral patches. 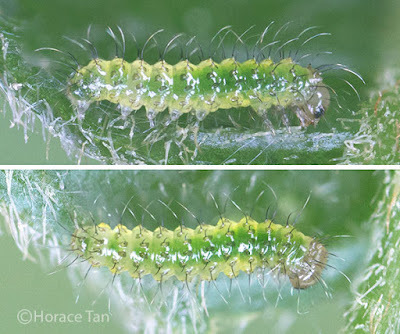 Two views of a newly hatched caterpillar of the Banded Yeoman, length: 2mm. 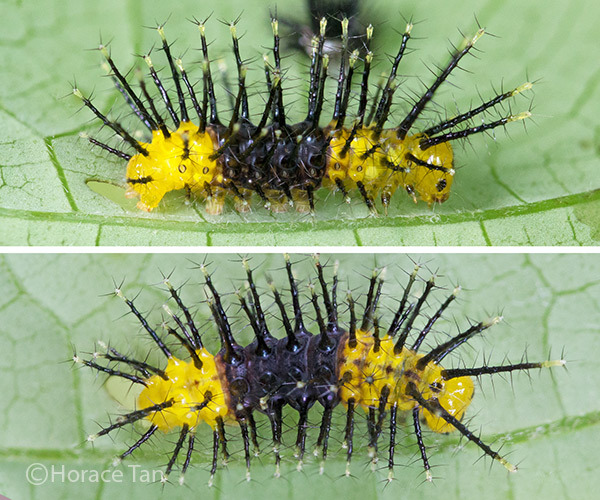 The 1st instar caterpillar feeds on the lamina of young leaves and between feeds, it typically rests on leaf underside against the midrib. 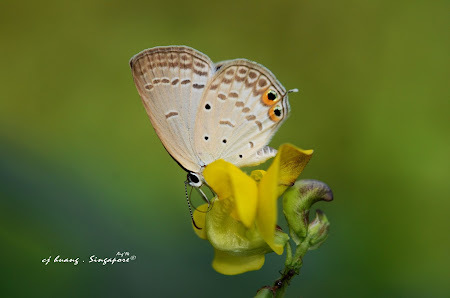 The body colour takes on a pale yellowish green undertone as it grows. After reaching about 4-4.2mm in 1.5-2 days, the caterpillar moults to the 2nd instar. Two views of a 1st instar caterpillar, length: 2.6mm. The body of the 2nd instar caterpillar is yellowish green. 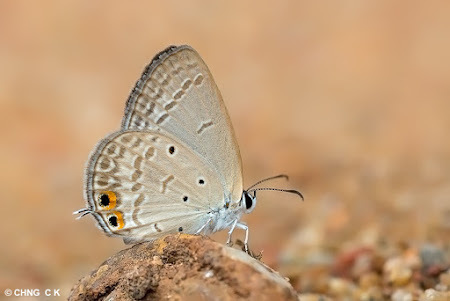 Long processes, greyish in colour, run along the length of the body. 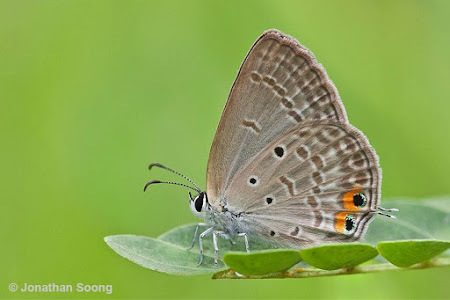 Each process has a number of fine, black, lateral spines emanating from it. 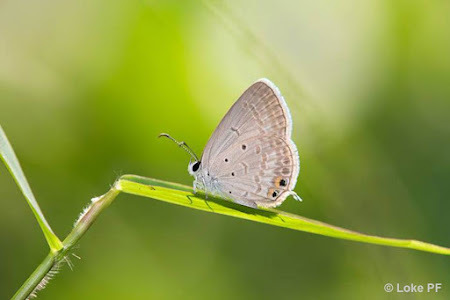 On each side of the body, there are three series of such processes: One series occurs dorso-laterally, another lateraly and the last sub-spiracularly. 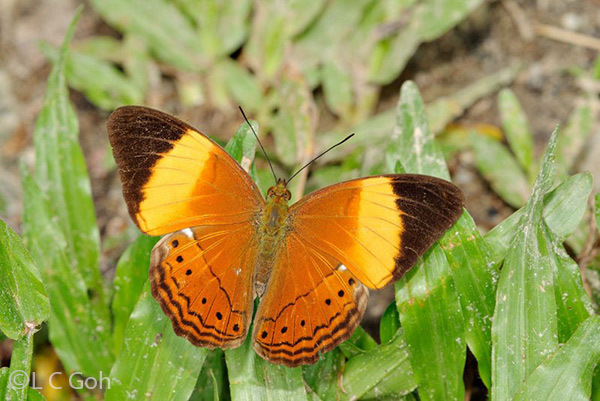 The head capsule is yellowish with two lateral black patches. 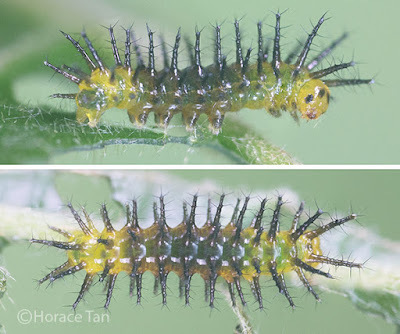 This instar lasts about 1-1.5 day with the body length reaching about 6.5mm. 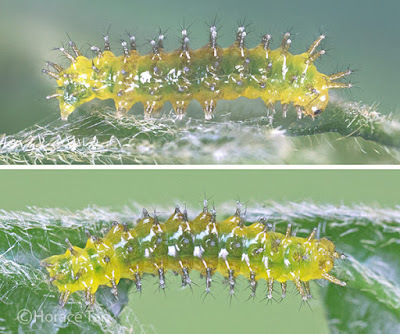 Two views of a newly moulted 2nd instar caterpillar. Two views of a 2nd instar caterpillar, length: 6mm. The 3rd instar caterpillar has the dorso-lateral and lateral processes proportionately longer and black in color. 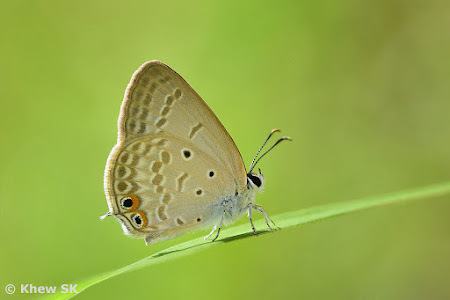 The body is yellowish with a green undertone in all segments except for the 3rd to 6th abdominal segments which are dark greenish to brownish. 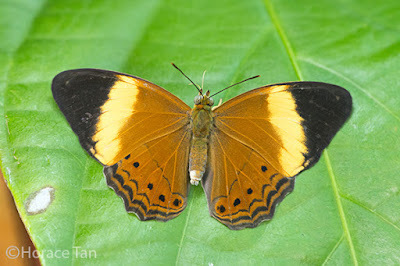 The head capsule is still yellow but now featuring four small, but prominent black patches. This instar takes about 1.5-2 days to complete with body length reaching about 11mm. Two views of a 3rd instar caterpillar, length: 7mm. 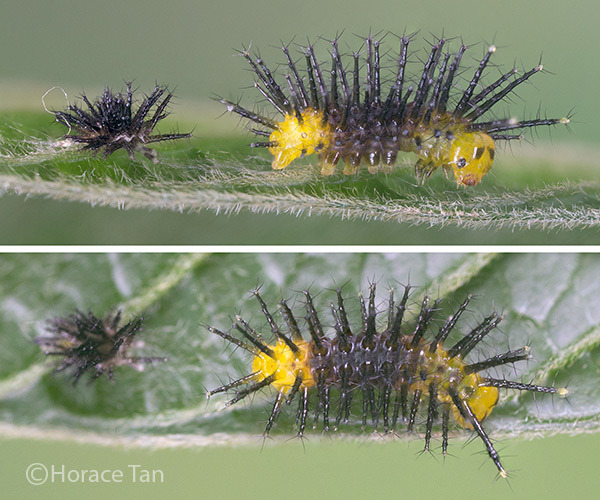 Two views of a 3rd instar caterpillar, length: 9.5mm. 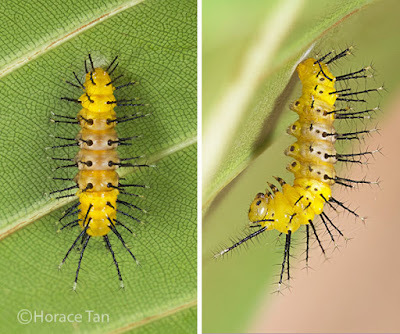 The 4th instar caterpillar closely resembles the 3rd instar caterpillar. It has proportionately longer processes when compared those in the 3rd instar. These processes are mostly white-tipped. 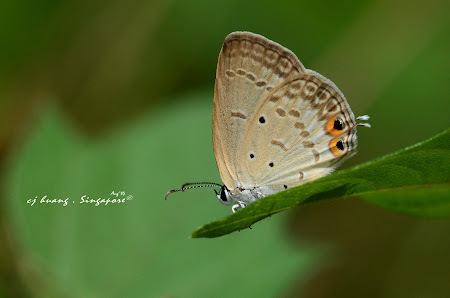 Furthermore, the 3rd to 6th abdominal segments are now darker than they were in the 3rd instar, being in dark brown to black. This penultimate nstar lasts about 2 days with the body length reaching about 17mm. Two views of a newly moulted 4th instar caterpillar. 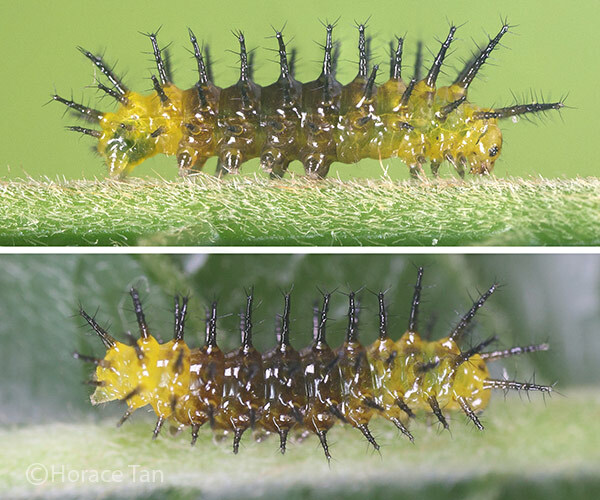 Two views of a d 4th instar caterpillar, length: 13.5mm. 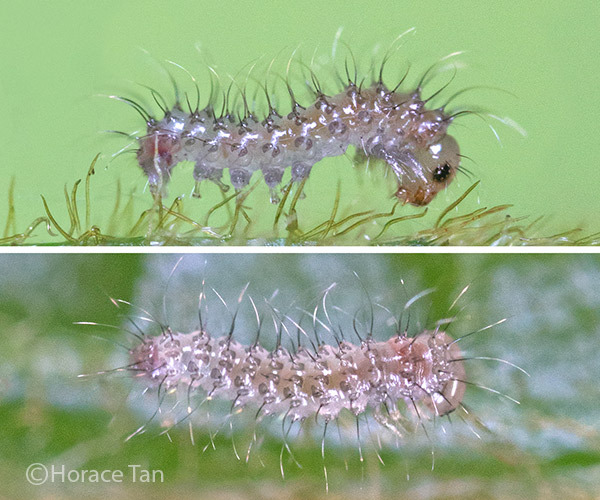 The 5th (and final) instar caterpillar bears close resemblance to the 4th instar caterpillar. 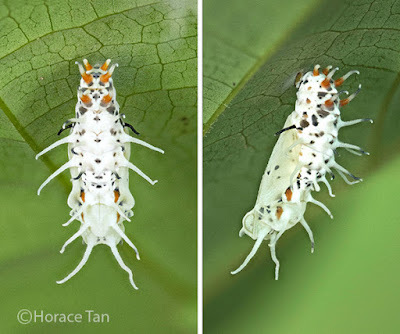 Compared to those in the 4th instar, the white tips of the long processes are proportionately longer and more prominent. 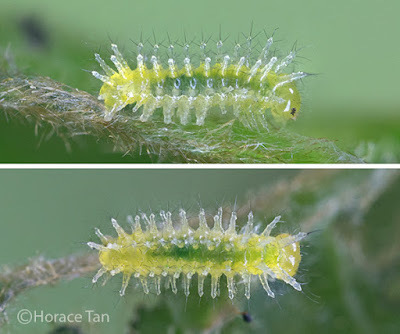 An early 5th instar caterpillar of the Banded Yeoman. 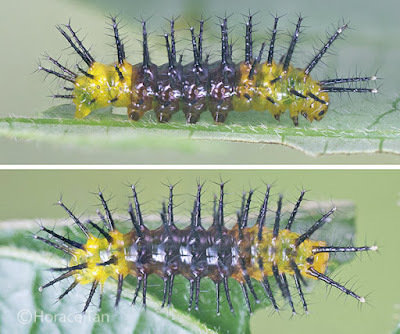 Two views of a 5th instar caterpillar, length: 27mm. 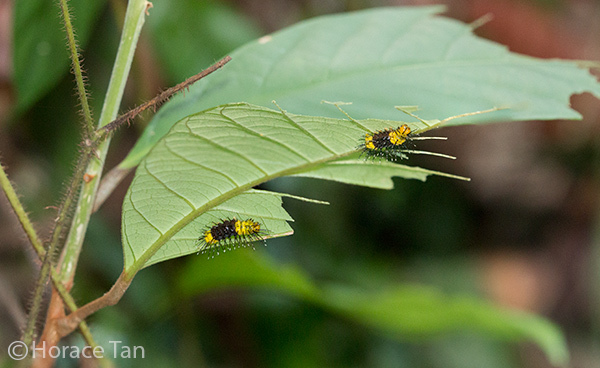 Two 5th instar caterpillars sighted on the leaf underside in the field. The 5th instar lasts for 3-4 days, and the body length reaches up to 29mm. On the last 0.5 day, the body shortens and decolorizes to pale beige brown in the 3rd to 6th abdominal segments. The caterpillar ceases feeding and wanders around. Eventually it stops at a spot on the underside of a leaf, and spins a silk pad from which it hangs vertically to take on the pre-pupatory pose. 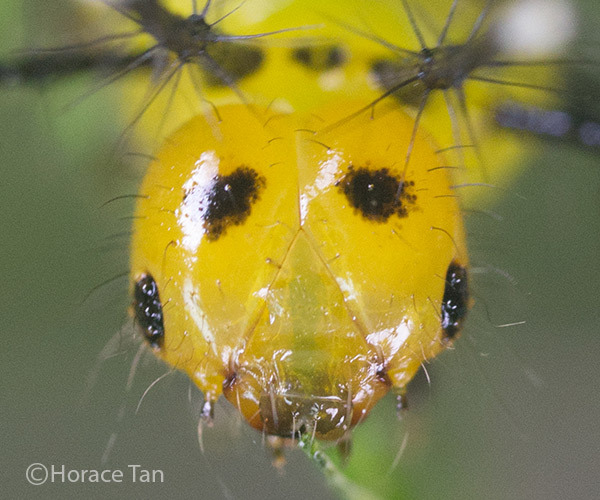 Front view of the head capsule of a 5th instar caterpillar of the Banded Yeoman. 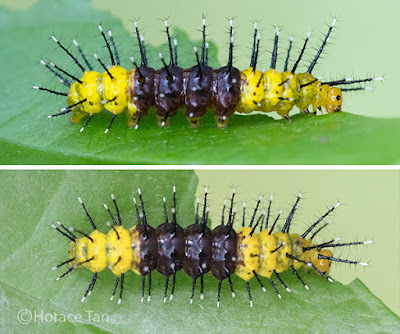 Two views of a pre-pupatory larva of the Banded Yeoman. Pupation takes place about 0.5 days later. 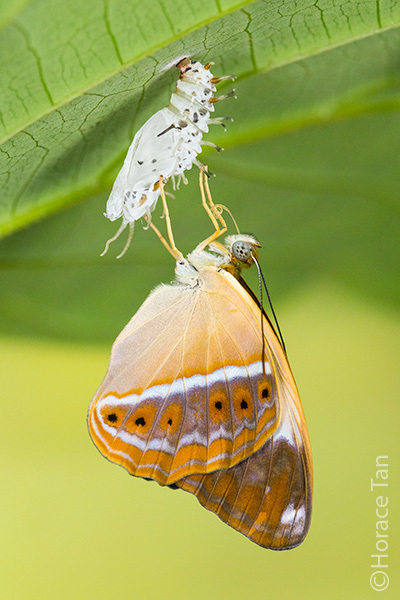 The pupa suspends itself from the silk pad via the cremaster attachment. It is almost entirely white and bears a few small, black patches dorsally. 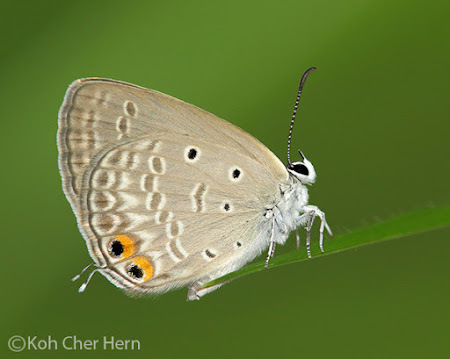 Dorso-laterally, along the body length, there are pairs of long, white, curled processes, one to each segment. 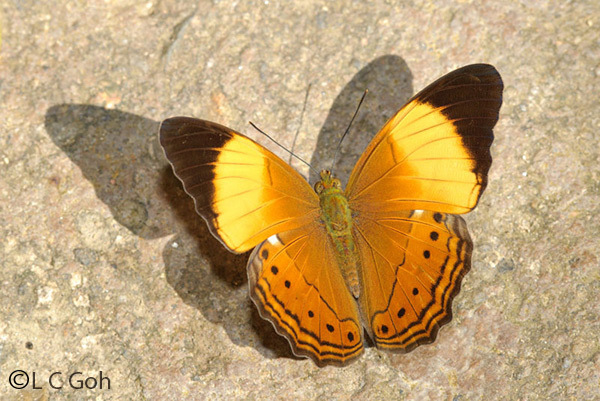 Posterior pairs of these processes are orange basally and black below the tip. Length of pupae: 17-19mm. 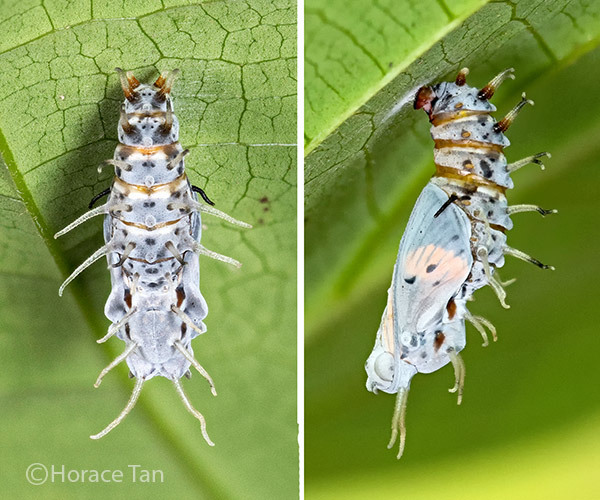 Two views of a pupa of the Banded Yeoman. Two views of a mature pupa of the Banded Yeoman. After about 4 days of development, the pupal skin of the mature pupa turns translucent and the wing upperside become discernible as a result. 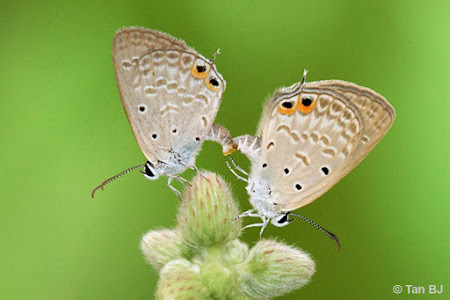 The eclosion event takes place the next day. 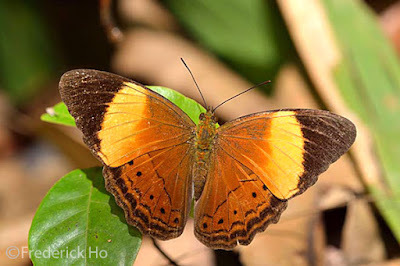 The eclosion event of a Banded Yeoman. 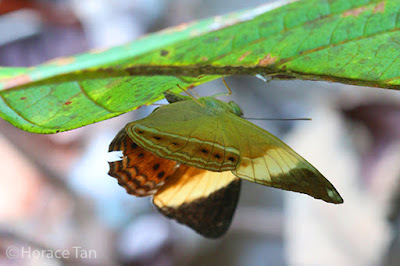 A newly eclosed male Banded Yeoman resting on its pupal case. A Field Guide to the Butterflies of Singapore, Khew S.K., Ink On Paper Communications, 2nd Edition, 2015. 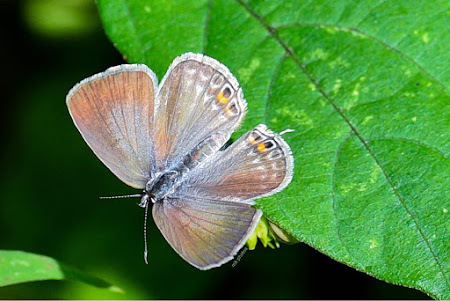 Special acknowledgement to Craig Williams for identifying the local host plant of the Banded Yeoman as Ryparosa scortechinii.